Just 40 minutes from Florence you find our 15th century buildings, Arco and La Cantina di Bacco, both belonging to a historical farming estate , officially certified for being very ancient by the Chamber of Commerce of Florence . As a matter of fact the "Fattoria" is in the hands of the same family since 1645. The two ancient little buildings are nestled on a hilltop above Londa, a quaint little village 10 minutes drive away in the Chianti Rufina region. From their idyllic, secluded position one can enjoy the view of the Sieve valley and the Mugello woodland which well deserves the name of the" green heart of Tuscany". La Cantina , an old haybarn, and Arco, a former oil-mill have been restored using typical materials such as terracotta floors and chestnut exposed beams .The original stone floors at Arco have all been carefully preserved. The location is ideal for day trips to the many historical Tuscan cities and to the coast or just for a relaxing holiday in a peaceful unspoiled setting among olive groves . If you choose to come with friends or family our houses are a perfect solution: close but quite independent and private with their own private gardens, shady and sunny spots and beautiful views. The houses are furnished with antique and local furniture which complete their rustic charm. Downstairs: living-room with sofa and armchair in front of the fireplace, table and chairs. Upstairs: large double bedroom with desk and chest of drawers. En-suite bathroom with shower, basin and washing machine. Walk-in closet. A folding bed could be added for a child but not suitable for toddlers because the stairs can be a bit dangerous. Last but not least, if you come at the end of the summer you ll be able to taste an excellent quality of peach " La Pesca Regina di Londa" . To this quality Londa dedicates a festival in the second week of September. The owner is my sister PaolaMy name is Maria Luisa and i' in charge of thebookings, but my sister will be the one togive you a warm welcome when you get here W've been spending a great part of our lives in this area of Tuscany, which we know very well.The cottages which we offer for rent are part of a country estate which belonged to our mother's family. Since we inherited the property we've been spending time and money to restore them and decided to rent them out in order to maintain them in good shape and pass them to our children and grandchildren in the future. You can Always refer to me , because I know the property very wel and live near itI love this job. It gives me the opportunity of meeting new people who sometimes become good friends and like visiting us year after year. The farming area around the coottages , mainly olive groves, gives the landscape a typical Tuscan appeal. We have always farmed organically without using any kind of chemicals and therefore the air is pure healthy and filled with the natural fragances of the original plants grown in our gardens, Scents of lavender rosmary and wild roses will welcome you on arrival. The views are fantastic , being the cottages set on top of a hill 450 mts on sea level. Notes on accommodation: Cot and highchair available for unit 2 if required. Please ask at booking time. Pets allowed. The owners live in Londa and are available for anything you may need. Towels and linens are provided. Final cleaning included in the rental price. Electricity and gas included. Central heating not included. Internet access in the pool area. We spent a week in La Cantina and it was an idyllic spot and a lovely, cosy cottage. We appreciated the simple, rustic nature of the cottage itself and the generous garden, which was private, nicely maintained and well supplied with chairs, tables, barbecue etc. In particular, the garden had a covered terrace / outdoor eating area with lovely views and the most wonderful overhanging grapevine with ripe, juicy grapes we were encouraged to help ourselves to - such a luxury! We were lucky with the weather - hot days and cool evenings / nights. This meant we could take full advantage of the outdoor pool, which was an excellent shared facility, set in a large garden with lovely views, and which we often had to ourselves or shared with just one other couple. It also meant we used the open fire in the cottage at night and took advantage of the supply of logs for the purpose. Beyond the cottage, the local town was small and friendly, with good local shops which met all our needs for food and supplies, and a couple of nice restaurants. We also took advantage of the owners' free vist to the ir olive press and oil tasting session, which was great. The cottage was well placed for days out too, and our favourite was probably the day in beautiful Florence via train from the local station. Overall, we had an excellent time and would highly recommend this location and cottage. 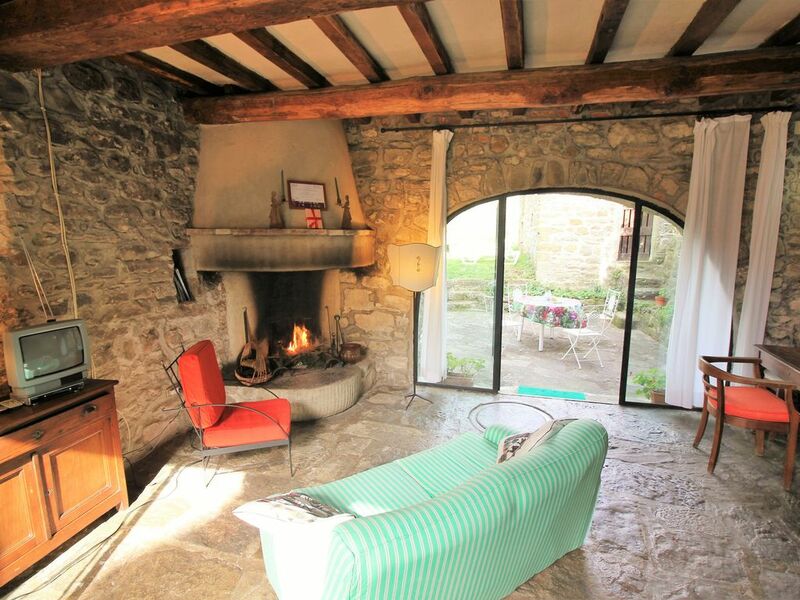 Casa Arco in Vierle is incredibly charming, restful and cosy! Our two little dogs enjoy playing in the large and well kept garden while we are sipping a cool drink in the sun-loungers and admire the inspiring countryside. We have spent already several times our vacation at different places in Tuscany. "Casa Arco", however, was by far one of the most beautiful and clean places we have been. We enjoyed especially the peace and quiet and the intact nature all around. "Arco" has been restored and furnished with great attention to details, a really nice idea for example was to hide the kitchen in a wardrobe. We also loved the spacious garden and outdoor area (two terraces belonging to "Arco") with a wonderful view to the mountains. So it was easy to find a suitable place to relax at any time of day. Although the site is located in a secluded spot in the mountains, many destinations can be easily reached from there: the beautiful city of Florence, the Franciscan monastery of La Verna, Poppi with its imposing castle and so much more. Particularly interesting was also the free visit an tasting of products in the family' s own olive oil mill. Who wants to be self-catering will find some nice little shops at Londa, but there are also a number of good restaurants in this area. We thank the owners for their warm hospitality and for their efforts to maintain this lovely property as a holiday rental home. A truly delightful little holiday home, nestled in the midst of the beautiful Tuscan Hills full of charm and character, integral with Tuscany itself. Our favourite places to visit from Cantina Di Bacco are very easy drives from here - Florence, Siena and Chianti. The quaint little cottage, impeccably clean and maintained to a high standard with very pretty and well kept gardens. The owners are incredibly accommodating, wishing to please, and lovely to meet.They are very proud of this adorable, cosy and comfortable little holiday home, and justly so - an absolute Tuscan Gem for all who choose to stay and enjoy. Relaxation at it's very best. we would highly recommend Cantina Di Bacco to friends,family and anyone else who asked us. We loved every minute of our stay here AND are returning just a year later.